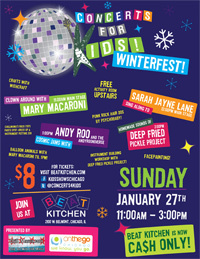 It was great to see sooooo many of our readers rockin' out with us last Sunday at Beat Kitchen's Winter Fest. We had an excellent turn out and saw lots of familiar faces and met new friends, too. We had everyone from the king of rock n roll to moooooving instrumentalists, and a dragon tearin' it up on washboard! ChiIL Mama's Instrument Petting Zoo and Rockin' Costume Bin were hands on fun for everyone--even the big kids (AKA: adults). They got into the rock spirit to begin with, arriving in t's ranging from Husker Du and Beastie Boys to Motley Crue and more.... It was great to see them getting into costume and having as much fun rockin' the instruments as the rock tots and punk kin were! And it was a joy to see our friends from Psycho Baby getting colorful with the hair spray and mohawks. Face painting and balloon animals with Mary Macaroni (who also played a set) were back. Even Deep Fried Pickle Project pitched in with a DIY instrument table and then closed out the day with a rockin' set on the main stage. If you missed our video interview with Deep Fried Pickle Project/live show footage, click here and check it out. We'll have lots of their show clips up in the coming weeks. Keep checking back in with ChiIL Mama for loads of original content including our live show footage, photo filled recaps, and video band interviews. We have some seriously sweet multi CD kindie giveaways and reviews coming up this month too. And as always, we have 4 free tickets to EVERY Beat Kitchen Concert for Kids. Click here to enter to win any/all FEBRUARY Beat Kitchen family friendly shows. We never spam, sell or share info. Enter through Thurs. midnight each week and check back Friday for our winner announcements. Click the quick links for each giveaway in the right side bar to enter. This Friday 2/1 we're announcing our American Girl Saige Doll Winner, Beat Kitchen Concert Winner, AND Rock N Pop Circus Winner.